Join us for a fundraiser and preview of Joshua Sweeny’s Same Difference, a feature-length documentary on the impact a supportive school environment can make for queer teens. Same Difference follows the lives of two adolescent boys – Graeme Taylor and Justin Aaberg – who attend very different schools. Taylor attends an affirming and supportive academic school; Aaberg attends one that is non-inclusive and hostile. While Taylor thrives, Aaebrg was just one of nine youth that took their lives in his school district between 2009-2011. 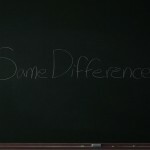 Same Difference examines how a school environment can determine whether teens thrive or are vulnerable to tragic consequences, and presents solutions on how to handle gender and identity issues among adolescents in schools today. Same Difference won best documentary film at the 2015 Albuquerque Film & Music Experience and is being considered for Sundance 2016. After the screening, Sweeny will discuss the film and take questions from the audience. Seating is limited so please register for this event here. Donations can also be made at the door. Cash only.